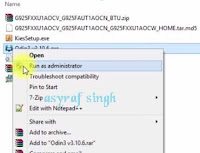 How to Flash Samsung Firmware / Stock ROM With ODIN (Step by Step). Flash Samsung Firmware Via ODIN. If you are the Samsung mobile user, you must know what is ODIN software. ODIN is a utility software developed and used internally by Samsung. So, by using ODIN software you can flash a firmware or stock ROM, even custom ROM to Android Samsung smartphone device. Besides that, ODIN also used to solve a boot loop or bricked Samsung device. To run ODIN you need a Windows OS based computer. Your Samsung device change from official to custom or modified. And you wonder to change this status from custom or modified to official again. Your Android Samsung can't receive OTA update. So, you can't get the latest feature of the currently running OS. Usually, this issue shows up after rooting your Android Samsung phone. Downgrade or upgrade the Samsung firmware. This isn't officially Samsung guide, this is a general guide created by guidebelajar.blogspot.com, So, if you interest to flash your Samsung device with this guide, you must do it by yourself, we didn't give any guarantee to your Samsung phone after applying the following guidelines. Step By Step Flash Stock ROM via ODIN. Then, you must have a Firmware or Stock ROM for your Samsung Galaxy phone version. You can download the Samsung firmware at SamMobile.com. Or follow this guide how to download it. Now, get the latest ODIN software. The latest version when this guide made is V.3.12.7. Click here to get ODIN. Bring your Samsung phone into download mode. How to enter the Samsung phone into download mode? click here for more instruction. Under the Log tab: it will show that phone added. Now, click the AP or PDA button. It will browse the Samsung firmware, you can navigate to the folder where you put it. Only firmware files with *.tar, *.tar.md5, *.smd extensions are accepted. Under the options tab, Select the following options to check. Now click Start button proceed to write firmware file to Samsung phone. The flashing process will take approximately 5 to 10 minutes without your interventions. Once the flashing process is done and you didn't see any error, you will see notification PASS!, with a green background. For the other ODIN version, it shows Reset. If there is not something wrong, your phone will normally boot up. Once your phone ready to use, you can check the firmware versions. You can read this guide how to check the Samsung firmware version. 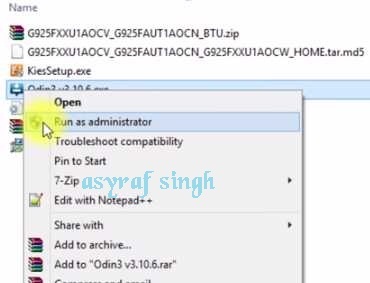 0 Response to "How to Flash Samsung Firmware / Stock ROM With ODIN (Step by Step)"